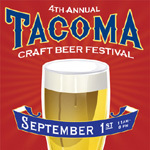 Tickets are now on sale for the 4th Annual Tacoma Craft Beer Festival (blog sponsor). The event takes place on Tacoma’s Foss Waterway on Saturday, September 1st from 11:00 a.m. to 8:00 p.m. This year the Tacoma Craft Beer Festival promises to be bigger and better than ever before. Last year 41 breweries participated. This year the event features beers from 50-something breweries. The event organizers made some changes going into the fourth year. In addition to their being more breweries, there will be more beer. Last year, the larger than expected (and thirstier than expected) crowd caused the event to get frightfully low on beer. Organizers assure us that beer shortages will not be a problem this year: arrangements have been made for breweries to supply more beer. This year organizers offer a VIP package. As a VIP you will have a separate, quicker entrance to the festival, a special seating area to share with brewers and brewery staff, and catered food to accompany the beer. On top of that, you’ll get a festival T-shirt. Saturday September 1st, 11:00 a.m. – 8:00 p.m.